The Jackie Robinson story was shown on TV recently. I’m not sure how many times I’ve seen it but it captivates me every time it is on. It inspires and disturbs me. The circumstances that he endured were unfair, unjust, cruel, mean, overwhelming and shameful. It disturbs me to think there was a time when that conduct was the norm in this great country that I love. But I am inspired by his courage and discipline that won a victory that is beyond measure. 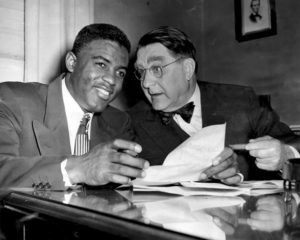 The conviction of Dodger’s owner Branch Rickey to fight the wrong when he could have looked the other way, reveals the strength of character that is required to make a difference in the world. Both men are heroes worthy or our admiration. Their lives mattered and they lived like it mattered. What they did and the way they did it challenges me to make a difference in a cause that is not completed. My actions are small compared to Robinson’s. But if there is something that I can do, even if it is small, it would be a sin-of-omission not to do it. When racial reconciliation was addressed at a Promise Keepers Pastor’s Conference a long time ago, they got my attention when somebody made the point, “If you aren’t part of the solution, you are part of the problem.” Well, I want to be part of the solution because there is a problem. Last year was a terrible year in our country for racial tension—among other things. Protests of white police shooting black men, white police being ambushed, a bunch of protests, some turning violent with fires and looting dominated the news every day. Now, post-election, the tensions continue, maybe even escalate. So, if there is anything I can do to be part of the solution I want to do it. During the riots in Charlotte I was in the post office mailing our book to a friend in Florida. When it was my turn to approach the counter, the window that was available to me was tended by an African-American man. I did not know him or anything about him so but I was convinced that I should say something. He looked at me with a, “I’m not sure what to make of this” expression. I was a little nervous because I wasn’t sure how he would take it. He didn’t look like a weak or insecure man, but he appreciated the respect I showed him. I know I like to hear that my life matters, so why wouldn’t he like to hear it. It was a little bit awkward, but the response was worth it. “What is the title of your book? I need to get a copy.” It took 30 seconds–maybe a minute. Small risk–unknown reward. But I believed I did the right thing and I felt like it made a small but positive difference. Then I got to thinking. What if every one of us who has read, Welcome to the Big Leagues—Every Man’s Journey to Significance, and everyone who has heard Darrel and I give the your-life-matters message and the challenge, tells someone else, “Your life matters”? And then, what if we took it a step further and found someone different than us—a white man tells a Hispanic man or a black man, “your life matters.” What if African American men realized that white men need to hear it too and felt empowered to look at a white man and said to him, “Your life matters”? Now let’s imagine that that somebody reading this figures out a way to keep track of the progress or promote it in a way that enables it to become a movement until a million men are involved in honoring another man with those three words, “Your life matters.” Maybe it is as simple as you and I just doing it and then posting the results on this blog. It is impossible to calculate how many conversations that would lead to or what the impact would be on a man’s life, but it is certain it would have an impact on our country—it would change our culture. Suspicion would give way to trust. Acts of brotherhood would replace acts of violence. It might actually fix a problem. Then again, it might be resisted and doing the right thing might have a cost, like it did to Branch and Jackie. Jackie Robinson’s courage made an impact beyond anything he could have hoped for or even imagine His impact continues after his life on this earth has ended. If I can do anything to help continue that impact at a time when our country needs some peace by building bridges over what divides us, I want to do it. So, if God choses to use or baseball story through Darrel Chaney’s life, it will have been a honor to write it and share it with you. I invite you to come up to the plate with us. The shape of a baseball field, spreads wide and far, a great picture unlimited potential. Your life matters and doing the right thing matters with potential big enough to change or world.